Preheat oven to 350°F. In a deep sheet pan, arrange squash, chiles, and half the butter. Roast for 25 minutes. Remove from oven. Smash roasted ingredients to make a puree. Add pico de gallo to puree and season with salt. In a pan, add oil. When hot, sear scallops on both sides until golden brown. Add maple syrup to pan to deglaze, and let it reduce until thick. Heat up another pan and when really hot, add the rest of the butter and cook butter for 10 to 15 seconds until brown. Add lemon juice, capers and lemon segments to make a sauce; no additional cooking time is needed. To plate, spoon 1/2 cup of butternut squash puree in the center of a plate. 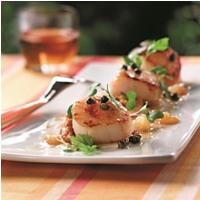 Arrange 3 scallops over the puree. Sauce with brown butter and add a touch of the maple reduction to finish it. Garnish with microcilantro. In a bowl, combine all ingredients, making sure the tomatoes are more visible than the onions. Read Freshen Up Happy Hour for more recipe ideas from Pure Canada Maple Syrup.